A darling blue hippo with an orange nose will chomp a staple into your papers to keep them from flying off across the savanna. Constructed of sturdy wood with metal works, this Hippopotamus Desk Stapler is sure to make a big impression for your friends, classmates or colleagues. So cute, kids and adults alike will have fun with it. 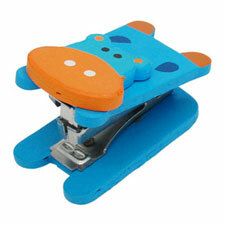 Unique design Hippopotamus Desk Stapler is sure to please any child or adult. Made with wooden and metal material, it features excellent paint and craftsmanship. Lightweight and compact, this Wooden Desk Stapler is easy to carry in your pocket, pencil box, school bag, handbag and etc. Use it to nail your paper document or stationery together. Useful and portable Wooden Stapler is suitable for school, home or office! When not in use, it is also a great decoration for your desktop. Best gift choice for children, friends or colleagues. It is compatible with 0.38" wide staple.